It’s probably safe to say that Harper Campbell has a Type A personality. In fact, in order to cope after the death of her mother, Harper has developed exactly 537 rules that help keep her life orderly and predictable, both academically and socially (not that she has much of a social life to speak of). Her first rule is to always take care of her twin brother, Cole, who seems to have gotten himself into some fairly serious trouble recently. Harper is convinced that the reason Cole is in trouble involves his new roommate, Sterling Lane, who has become rather infamous over the years, being expelled from more expensive schools that one can count. While Cole warmly defends and praises his new roommate, and the school administration seem very convinced that Mr Lane has turned over a new leaf and is a reformed character, Harper sees him for the dangerous delinquent that he really is and is determined to expose his sins to the world. To prove that Sterling is bad news, Harper keeps being forced to break one or several of her precious rules, only to find that Sterling is always two steps ahead of her, usually framing her for something much worse than she’s trying to get him reported for. 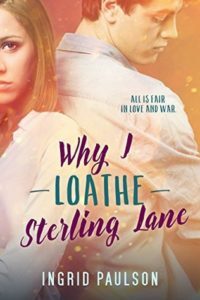 But while Harper is so very determined to bring Sterling Lane down, she forgets about her first and most important rule, and Cole’s troubles keep getting worse. He may end up getting expelled and/or facing criminal charges. Harper has no choice but to swallow her animosity and actually work together with her nemesis to prove Cole’s innocence. She may discover that she and Sterling Lane aren’t so different after all, in fact, they seem to be two sides of a rather devious coin. And perhaps she doesn’t entirely and completely loathe him either. Share the post "How do I hate thee? Let me count the ways"
This looks fun and the title is awesome.